Music fans usually associate the Motor City with soul music; vintage electric blues; or the heavy rock of MC5, Ted Nugent, and others -- in fact, anything but bluegrass. The brothers Steve, Paul, and Ralph Colwell were in fact all natives of Detroit, born in a mad jumble of diapers, sleepless nights, and wailing between 1933 and 1937; meaning that the already rich Detroit music scene can also brag of at least a small load of vintage bluegrass brother-group talent. But this was a family that skipped around the country quite a bit, relocating to both Massachusetts and eventually Los Angeles, where the singing and picking brothers finally began their professional career in the late '40s, basically the Stone Age in terms of modern bluegrass. The Colwell Brothers first created attention performing as guests on the Tex William Show, then returned to their old Midwest stomping grounds. The group performed featured spots on several large radio stations in both Louisville and Cincinnati before hosting their own regular television show on WFBM in the Indianapolis area. Hollywood beckoned again in 1951. While back in Los Angeles, the brothers put their pens to a contract with Columbia and began cutting material, which even included appearances by hotshot string-meister Joe Maphis, who played guitar as well as an admirable tenor banjo track on the song "Bluebonnet Lane." Maphis, never a slouch, takes a type of banjo more commonly associated with Irish music and Dixieland and does his darndest to get a sound like early Earl Scruggs, playing rings around everyone else on the record, and almost compensating for the lack of a fifth string in the process. Jim & Jesse re-cut this song in 1961, and it became a bluegrass standard. Steve Colwell ventured from bluegrass to baseball around the same time as the group's Columbia recordings, apparently not caring a hee-haw about the potential damage to a digit that can be caused by a good hardball. Meanwhile, his younger brothers were still in high school, no doubt thrilled with the exposure the group got in country & western fan magazines as a result of their recording efforts. Despite the small-scale success of the records, the group seems to have lost interest and no further sessions were done. Only a single sighting of brother Paul Colwell -- mentioned in passing during a Maphis interview -- keeps The Colwell Brothers from being completely missing in action. Other songs recorded by the group include the enjoyable "New Heart Yodel," the waggish "The Puppy Dogs Tail," and the understated "The Devil Is a Rascal." 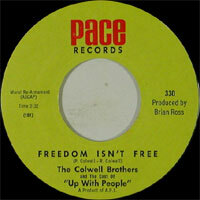 Obscure recording activity has also gone on by other family bands or musicians pretending to be related and using the name Colwell Brothers, including members of the horrifying Up With People soundtrack. Judging by the latter group's song entitled "You Can't Live Crooked and Think Straight" getting selected for inclusion on Miserable Melodies, an Internet site dedicated to the worst songs ever recorded, no other Colwell Brothers are on par with the Motor City bluegrass legends.